Artist Chris Doman often depicts elements of both abstract and realism in his artwork. 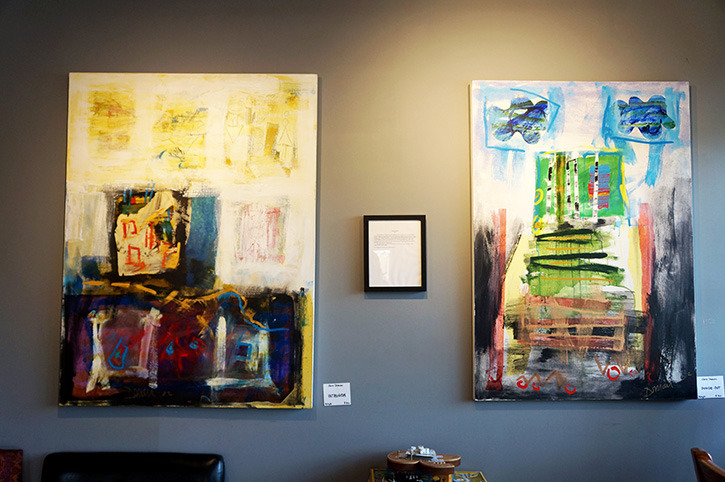 Several of his retrospective pieces can now be seen at Burde Beans Coffee and Things. Chris Doman's "retrospective" artwork is on display now at Burde Beans Coffee and Things. Burde Beans Coffee and Things is now serving up a side of art with their coffee products, featuring artists in the Burde Street shop like painter and printmaker Chris Doman. The Wales born artist paints with both oil and acrylic, fusing together colourful images that tend to balance on the horizon of abstract and realism. Doman’s “retrospective” exhibit at Burde Beans consists of several paintings from his past that were completed close to 10 years ago. He said the coffee shop owners wanted paintings quick so he pulled out some of his old work for the exhibit. Doman has been creating art as long as he can remember. Growing up mainly in England, he received art training for four years at Hornsey College of Art in the 1960s and then went on to teacher training after that. Now retired, Doman taught art, graphics and journalism courses in schools around the Island for most of his career. His longest teaching stint was at Parkland Secondary School– which he helped open– in Sidney, B.C. where he spent nearly 20 years. Moving to the Valley eight years ago from Brentwood Bay, Doman says he’s quite impressed with Port Alberni’s art scene. The retired teacher now does most of his artwork in his home studio in the basement of his house. Doman lives near the Rotary Arts District just off Argyle Street which can be seen in some of his newer pieces. In addition to his artwork, Doman co-runs an online magazine called Avenue Zone that highlights and promotes arts and culture in the Alberni Valley. Thatcher Stokes, co-owner at Burde Beans, said Doman’s retrospective art will probably remain on the shop’s walls for the next couple of weeks. For more Chris Doman art visit www.chrisdoman.com.